Adrenal Cortex Vegetarian Capsules by Thorne Research help the body by providing pure adrenal cortex tissue to support healthy adrenal function. This can help maintain the body’s normal stress and immune responses‚ especially if they have been impaired. 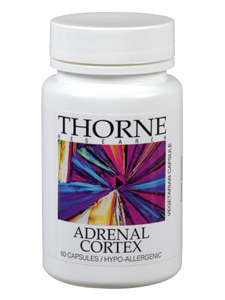 As you would expect from any other Thorne Research product‚ this Adrenal Cortex supplement is made to comply with the highest quality standards. As with Thorne Research’s many other products‚ Adrenal Cortex does not contain any lubricants‚ diluents‚ preservatives or magnesium stearate. Tamper Evident: Use only if bottle is sealed. If pregnant, consult your health-care practitioner before using this product. Store tightly sealed in a cool, dry place.